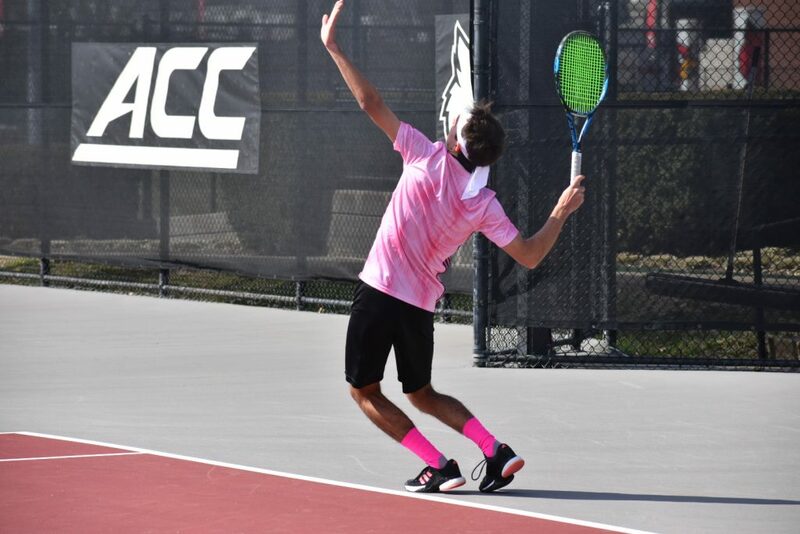 Men’s tennis (15-10) traveled to Georgia Tech this Sunday, April 7, leaving with a 4-1 loss. They hold a 3-7 conference record after this weekend. The doubles lineup included 90th-ranked Christopher Morin-Kougoucheff and Fabien Salle at the No. 1 spot, seniors Federico Gomez and George Hedley at the No. 2 spot, and freshmen Alex Wesbrooks and Marcus Sulen at the No. 3 spot. Georgia Tech made the first move, winning on court three. Wesbrooks and Sulen fell 6-1 to Pablo Schelcher and Joseph Gandolfo (GT). Soon after, Kougoucheff and Salle were defeated by No. 1 Phillip Gresk and Carlos Divar (GT) (6-1). The Yellow Jackets clinched the doubles point before the match on court two was finished. Hedley and Gomez were up 3-2 against Cole Gromley and Zummy Bauer (GT). The singles lineup consisted of Kougoucheff at No. 1, senior Brandon Lancaster at No. 2, Salle at No. 3, freshman Sergio Hernandez at No. 4, Gomez at No. 5, and junior Clement Filho at No. 6. Salle took down Phillip Gresk (GT) 6-2, 6-2 fairly quickly to tie up the score at 1-1. 115th-ranked Kougoucheff put up a good fight, but ultimately fell 7-5, 6-3 to 62nd-ranked Carlos Divar (GT). The Yellow Jackets went on to take over court four with a 6-3, 6-4 win over Hernandez. The match was clinched when Brandon Freestone (GT) defeated Filho 7-5, 6-3, bringing the overall score to 4-1. The Cards have a busy weekend ahead hosting Virginia Tech on Friday, April 12 at 2:30 and North Carolina on Sunday, April 14 at 1pm for their Senior Day, all at the Bass Rudd Tennis Center. Photo by Riley Vance / The Louisville Cardinal.